After spending all day in the office or on the job site, the last thing you really want to do is come home and sit inside. Canadian summers are beautiful but short, so we’re always looking for ways to maximize our outdoor time. But what about those days when there’s no shade from a hot sun or when a light rain shower has you running for cover. How many times have you stood in the rain watching over a lit barbecue hoping the food would hurry up and cook? You’ve worked hard for what you have, you deserve to enjoy the outside of your home, condo or cottage for more than a handful of days. Q-Exteriors awnings provide shelter from the sun and rain while complimenting your existing exterior aesthetics. 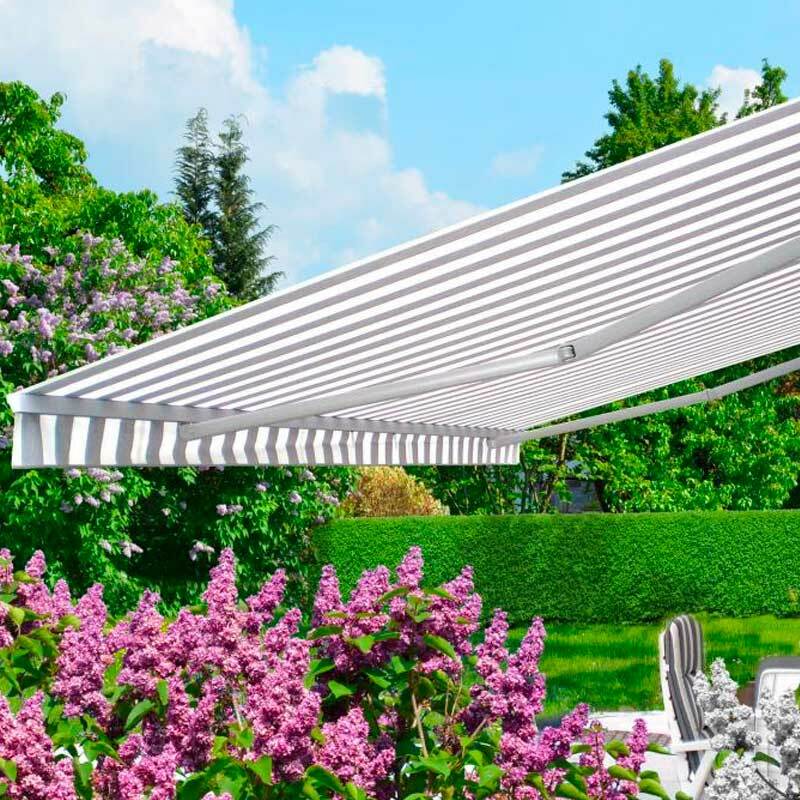 Adding an awning can lower the temperature on your patio by an astounding 20F. Imagine adding an entire room to your house, that instead of dry air conditioning, a cool breeze circulates, one with the perfect amount of sun, and instead of the hum of appliances you hear birds chirping or neighborhood children playing. A room with a truly uncompromised view. Sounds too good to be true, doesn’t it? But this is exactly what you get with a custom awning from Q-Exteriors. Q-Exteriors only installs Erhardt Markisen awnings that are produced in Germany by a company that has been in business for more than 80 years. Adding beautiful living space to your home isn’t the only advantage. They also block harmful UV rays, a leading cause of skin cancer. No more searching for shade, or rushing to move chairs when a shower rolls in. With an awning, you can enjoy the outdoors more often and after a long Canadian winter, you deserve it. Business names, logos, slogans, and colors can be reproduced flawlessly on our fixed commercial awnings. We install retractable awnings that range in length from 5ft to 23ft and our aluminum pan awnings and fixed commercial awnings can be designed to be much larger. Q-Exteriors awnings not only benefit the outside of your home but they also positively impact the inside. By diverting sunlight away from windows an awning blocks 75 % of the of the sun’s solar heat. This can reduce the temperature of your home up to 15F. That’s better than blinds or drapes lowering your air conditioning costs up to 25%. Q-Exterior uses only the highest quality products. Our residential retractable awnings are shipped from Germany while our commercial and A-frame awnings are manufactured right here in Ontario. But this doesn’t mean our awnings are out of reach for the average homeowner. Come by the showroom with a budget in mind and we will do our best to make sure you walk out with a product you will be satisfied with. Our fixed A-frame commercial awnings offer businesses extra shade from the sun and shelter from the rain but they’re also the perfect solution for exterior signage. More professional and secure than a sandwich board, but less costly than lightbox signs awnings bring a sophisticated charm to a business’s storefront. We can print business logos, slogans, and colours onto the awning fabric through a process known as sublimation printing. The design is dyed directly into the fabric, not an adhesive so it will never peel. Looking for a way to improve the exterior of your condominium without infringing on condo board bylaws? Many condominium boards don’t allow the addition of permanent structures and many are very particular about the outward appearance of the condos. However, awnings are often allowed because they do not permanently alter the exterior of the structure and with our vast library of fabric colors, we can usually find a fabric to match your condo’s style and look. You work hard for your money and suffer through Canadian winters. You deserve to enjoy your home, cottage or condominium’s outdoor area during the summer months. At Q-Exteriors we focus on ensuring our customers get what they want on time without hassle or stress. Contact us today or stop by the showroom and you will see that Q stands for Quality. When you shop with Q-Exteriors not only are you purchasing products of the highest quality but also the service of skilled tradespeople trained to strict standards. This is important because installing an awning is not a simple task. An improperly installed awning can cause property damage as well and serious injury. If you’re a DIY enthusiast awning installation may not be the weekend project you think it is. Money isn’t the only consideration when buying an awning. Think of the time and stress you will save by having Q-Exteriors staff of trained professionals install your new awning. We begin with a free in-home consultation where we let you know when the installation will take place and how long it will take. But the installation isn’t over until Q-Exteriors owner Nev performs a follow-up inspection. This is also his chance to answer any questions you might have and educate you on how to properly care for your new Q-Exteriors awning. Q-Exterior awnings come with a double backed 10-year warranty. How many products, expected to survive the Canadian climate year round come with a 10-year warranty? 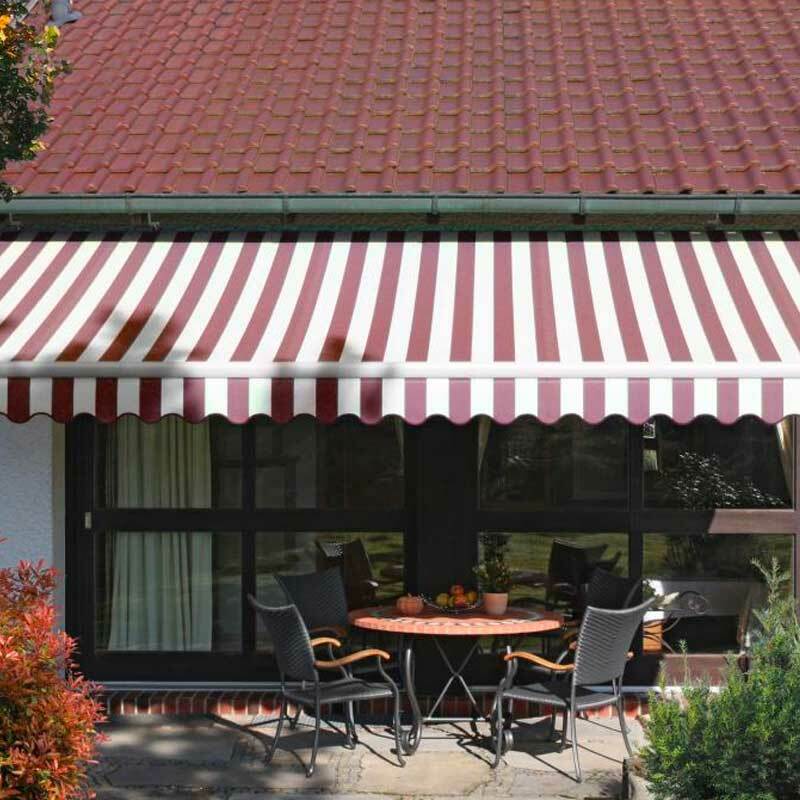 We only sell Erhardt Markisen awnings, which lead the industry in warranty and quality. In the event, anything does go wrong with your awning, simply contact us and we will inspect the awning and take care of the rest. We believe peace of mind is a very valuable thing. With Q-Exterior awnings, you can rest easy knowing your awning is produced by a company that has been in business for more than 80 years and installed by a business that has more than 10 years experience. We’re not a ‘here today, gone tomorrow’ business and our awnings aren’t either.